The EURCHF has drifted lower and recently grinding around its support level. I think we will see a move higher, partially due to fundamental data which will support a stronger Euro and partially do to some profit taking which will result in a short-covering rally. We may test the bottom of its support level before a rally can unfold. 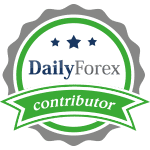 Forex traders may want to wait for a breakout above its most recent intra-day high for a confirmation of a trend reversal, personally I went long already.